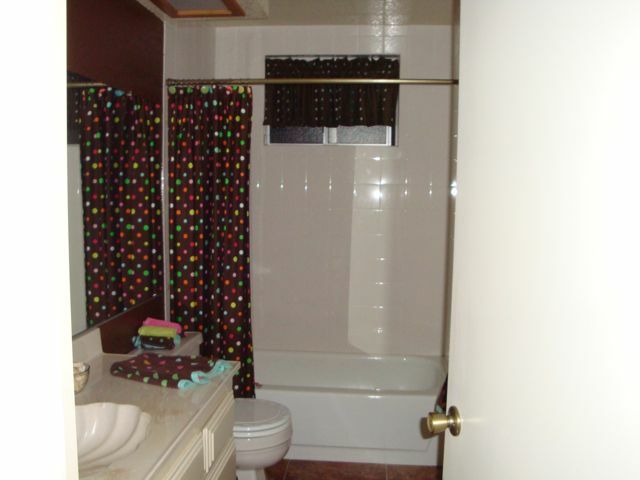 My Housing Project: Bathtub Makeover | Frankly, My Dear . . . 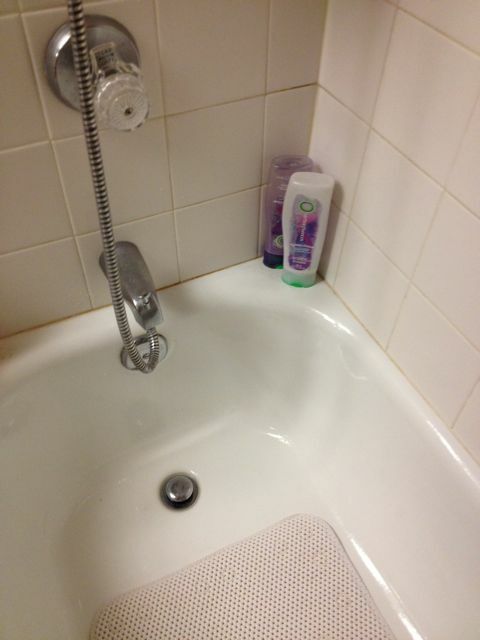 When we moved into Bedford Manor nearly four years ago, Dot’s bath was in pretty good shape. 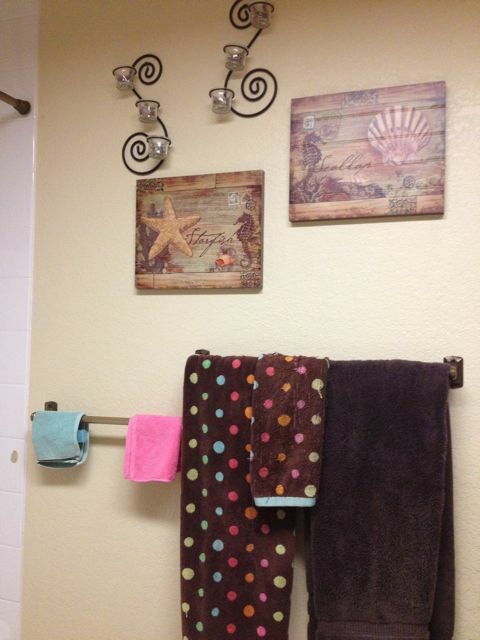 The only improvements we made at the time were to remove the left behind decor, paint the walls, and set up a Sandy Beach/Polka Dot theme that flowed well into Dot’s bedroom. What we didn’t take care of was the tub itself. 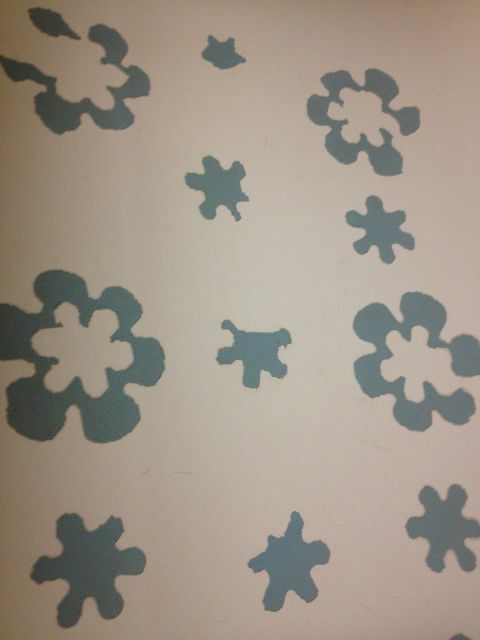 These blue flower stickees worked great to prevent slips and falls, and so it wasn’t really high on my To-Do List to remove them. Plus, I’d tried a few times and nothing seemed to work. I’d looked online for solutions and all of them called for strong anti-adhesives that were too chemical in composition. After the second try, we couldn’t enter the bathroom for 24 hours, the odor was so strong. And as life at Bedford Manor continued, the To-Do List was readjusted to fit the immediate needs and availability of both product and money. But lately it had become apparent that they were wearing out. 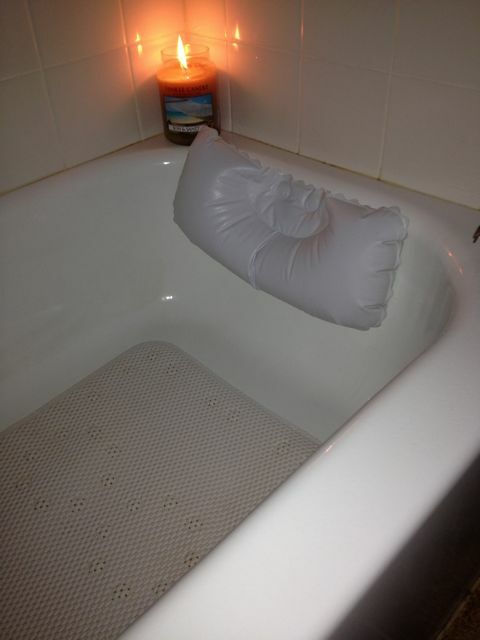 It was time for a Bath Tub Makeover. In desperation, I asked Obadiah (my coworker) if he had any ideas. Indeed he did. A can of WD-40 and a straight razor. Really? I pondered suspiciously. Could it really be that simple? He assured me it was. Spray. Wait. Scrape. Yes, he insisted. So we bought the necessary ingredients. 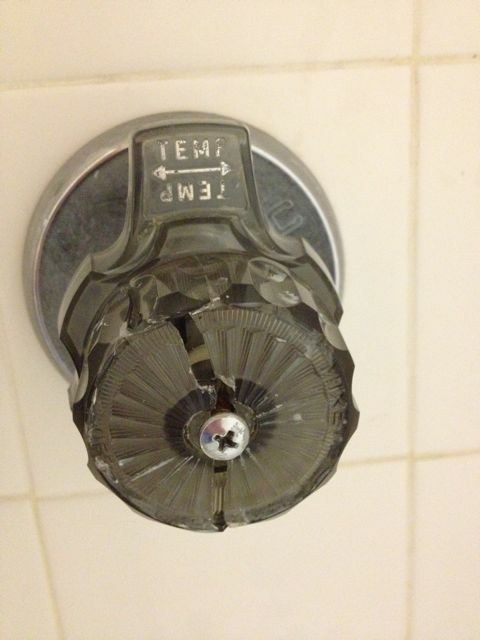 Of course, when it rains it pours and recently Dot’s water knob cracked. 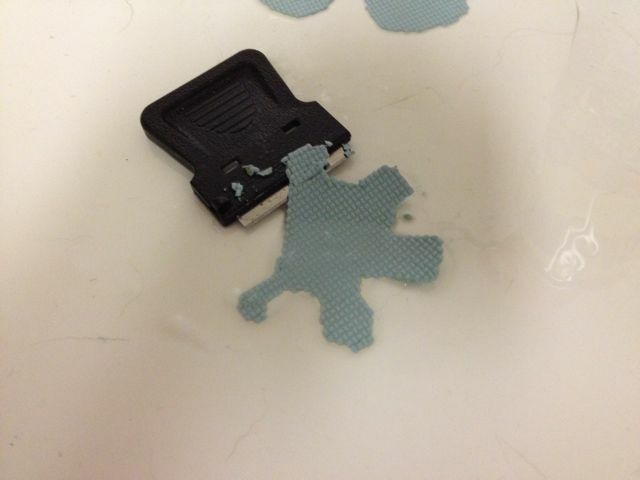 This morning she reminded me that I had already bought the replacement, and she couldn’t wait any longer. So I figured, What the heck. Let’s make tonight a Home Improvement Night. 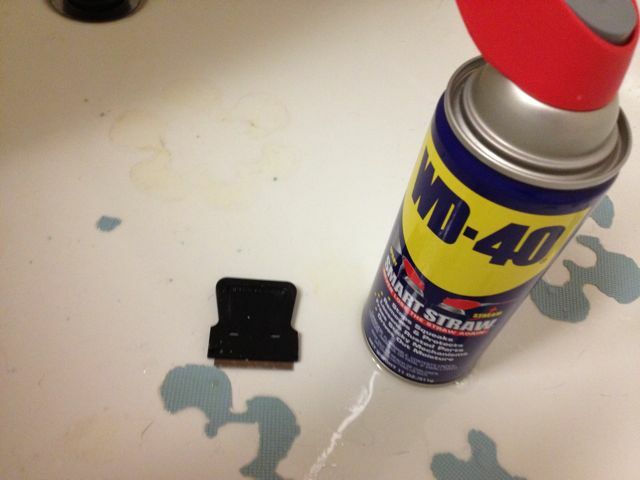 Since the WD-40 would need to sit for a few minutes, I sprayed the tub first. I made sure that each flower was fully coated, then went over them again for good measure. I was surprised that a little went a long way. As it began to work its magic, I worked on the knob. A quick unscrewing of the old and the new one was soon in its place. 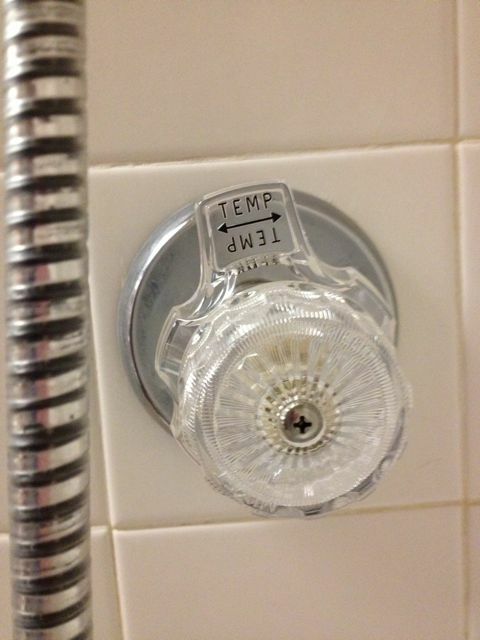 Dot’s choice of a clear knob instead of dark really brightened up the tile around it. Then it was time to scrape the tub. Scrape is really the wrong word. It was more like nudging, lifting. The razor slipped easily under stickees and separated them from the tub. In just about ten minutes, I had the entire tub scraped. 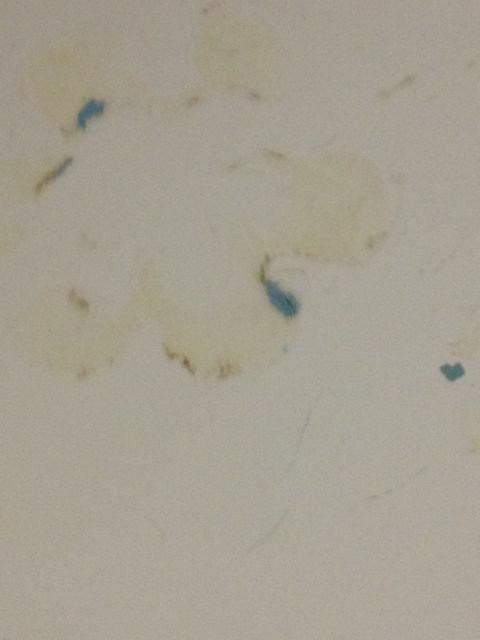 But there was still residue. 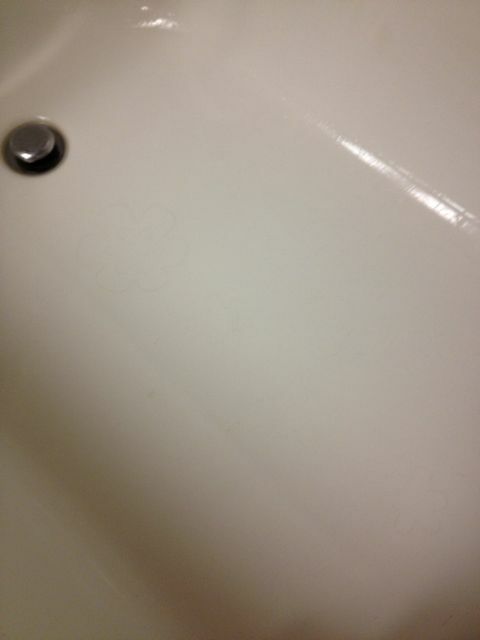 I was worried that the tub would be permanently shadowed with these outlines. My worries were conquered. Another quick spray of the WD-40 and another passing of the razor over the area, and the tub was residue free. A quick rinse with a mixture of hot water, vinegar and dish soap eliminated the final oils and dirt. Look at that tub shine! Of course, I can’t have Dot slipping and falling now that the stickees are gone. Good thing we bought a bath mat! 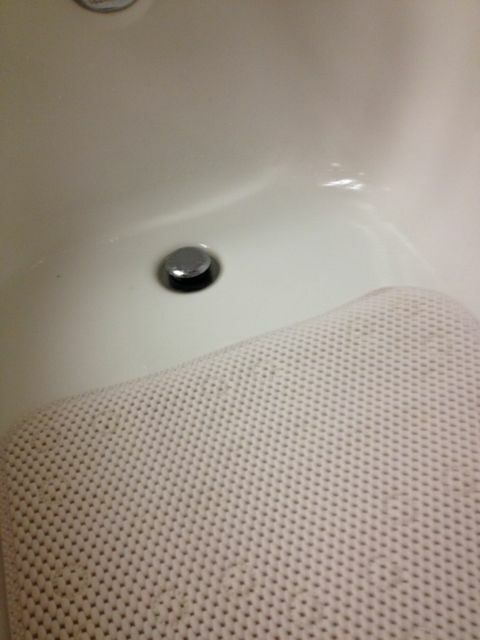 And now with a new knob and a nice mat, Dot’s tub has been made over. I can’t believe it’s the same tub! Less than $35 from start to finish. Doesn’t this look relaxing? And Dot? She loves it. In fact, she’s already in there washing her hair. I wish she’d hurry up… This Girl needs a bath. After all, it’s not easy being the Queen and Handyman of my own castle. Then, again… maybe it is. Great job! I wonder if it works on getting the darn toilet glue off the floor in my front bathroom! What a great, easy fix. I love it when something I thought was going to be terribly difficult turns out to be so simple.